Structured Settlement Buyers | Can You Sell Them Parts of Payments? Structured settlement purchasers and "split payments"
Selling payments to structured settlement buyers can be fairly flexible and you are not limited to sell immediately scheduled payments, or consecutive payments, or even the full portion of a payment. Indeed, you can decide to part payments and sell only a portion of a future lump sum payment or parts of each of a number of recurring periodic payments to a structured settlement buyer. Let's explore both methods below. Split Payments: annuity issuer parts a payments into two portions and sends out two separate payouts; the factored portion to the buyer of the structured settlement payments, and the untransferred portion to the original payees. Servicing: annuity issuer sends out the full payment to the company that buys the payments and assigns it liabilities to service payments and remit unfactored portions of each payment to the original payee. Splitting payments is the process of dividing payments in two parts, one part that continues to be paid out to you by the company that is liable to issue the payments to you under the original structured settlement agreement. The other portion is transferred to the structured settlement purchaser who agree to buy it out from you in return for a lump sum of cash that they pay out to you. Payments can be split and divided in any way that you prefer and agree. For example, you can sell half of each payment to a buyer, or you can part it any other way. Let's say, you are scheduled to receive monthly payments each in the amount of $1,000 for the next 20 years. You can decide to sell $400 of each payment starting from 5 years from now for a period of 10 years to a structured settlement buyer. Under such an agreement, the structured settlement company that is obligated to send the payments to you will continue to send full payments in the amount of $1,000 to you for the next 5 years. In the subsequent 10 years, they'll further continue to send you $400 monthly payments, while they'll send the remainder of these payments in the amount of $600 each to the structured settlement buyer. For the remaining 5 years, they'll resume to send you the full $1,000 monthly payments as scheduled. 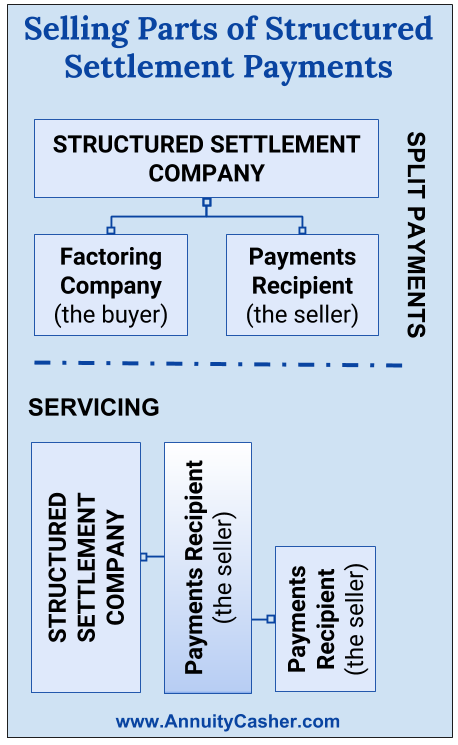 While split payments may appear as a desirable option for you, allowing you to sell portions while retain other parts of the same payments and not liquidating the entirety of the steady income streams of a given period, it may not not be an achievable choice due to opposition to split-payments by the company who is paying the proceeds to you. In fact, Structured Settlement Protection Acts, the laws that govern the process of selling your payments to third party structured settlement buyers, in most states include a provision barring division of payments in a buyout transaction when opposed by the structured settlement company that funds the annuity or that is obligated to issue the structured settlement payments to the annuitant (you). Indeed, structured settlement companies often object to split payments arguing that a division of payments increases the costs and obligations of the company to send out two separate payments in the same period (the same month, etc) to two different recipients instead of being liable only to one payee. In the wake of opposition of the structured settlement company, you may have to turn to explore the other possible option, i.e. structured settlement servicing, in order to sell only a portion of each of a number of payments to structured settlement buyers. Read here how you can sell portions of payments by entering a structured settlement Servicing agreement.